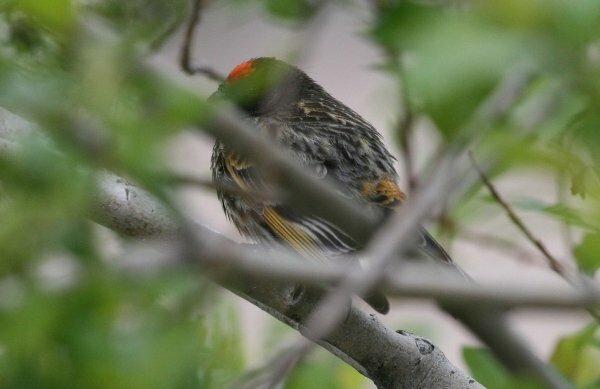 What may look like a cheesy title is a way of pointing out that the bird of this post is usually called Red-fronted Serin, yet BirdLife somehow refers to it as being Fire-fronted. Either way, we’re clearly talking pusillus when we are talking about this specific Serinus. 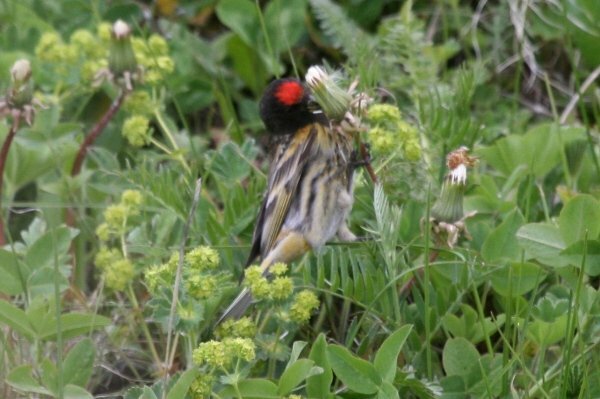 And beyond common and scientific names, we are talking about an extraordinary bird. 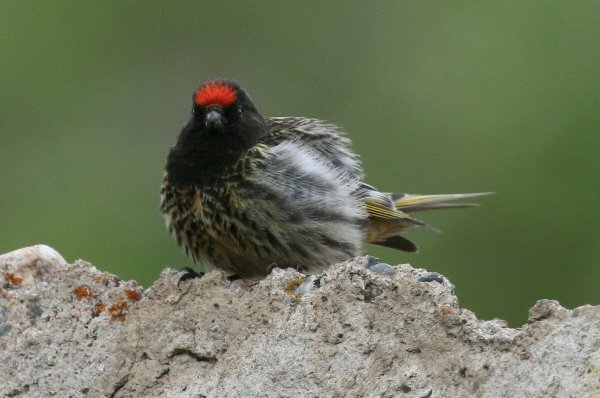 The Serins of the genus Serinus, here applied in the wider and likely incorrect sense, are a very diverse group of finches that mostly call Africa and the Middle East their home. As if this alone wouldn’t make them adorable enough, they also sport amazing colouration, are mostly small to very small in size, and exhibit a lively Yorkshire terrier personality to match. 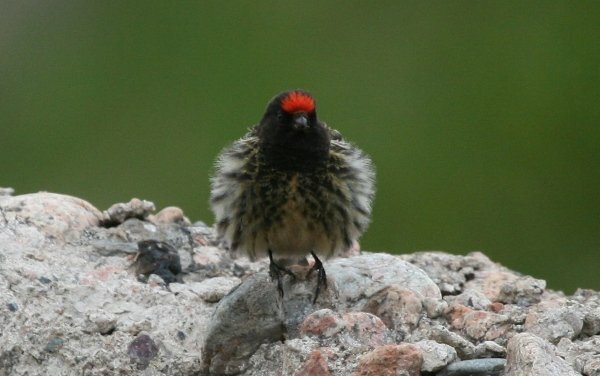 The Red-fronted Serin is no exception to this, which is remarkable considering its exceptionalism within the genus. Why is it exceptional? Well, for one it inhabits high mountain terrain from the northern part of the Middle East all the way to the Himalayas and the central Asian mountain ranges, reaching 3,200 m above sea level in Kazakhstan. It remains there year-round, with slight altitudinal movements in winter. Inhabiting the Tien Shan and enduring daytime temperatures of -25°C in winter is not bad when your genus has African roots. 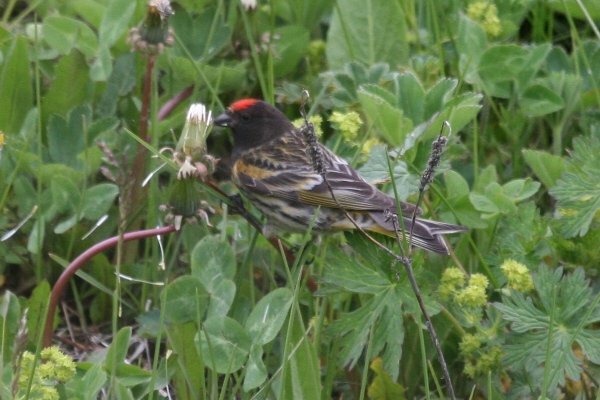 Furthermore, it has a very unusual colouration for a serin, a group almost defined by greens and yellows. Now, don’t get me wrong: serinian greens and yellows are not to be confused with phylloscopian tones. They are much brighter and make for some sunny finch experiences. 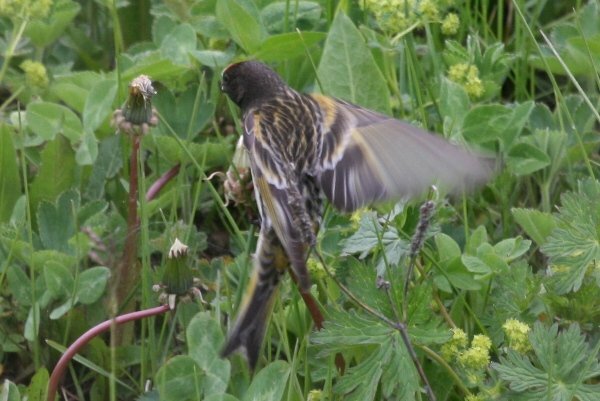 And of course there are also other serins who deviate from this colour routine, like the Damara and Black-headed Serins of southern Africa. 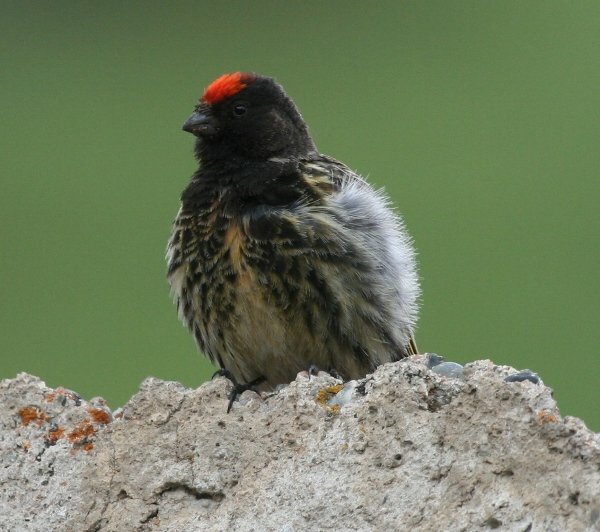 But nothing really compares to the almost diabolical red and black of Serinus pusillus. In fact, when I came across a small flock at the shores of Big Almaty Lake in Kazakhstan during a day trip up into the mountains in June this year, I was captivated in such a way that it took the whistle from a Himalayan Snowcock to remind me that I had not only come here to walk a hundred metres beyond the parking lot and sit down in a small meadow, but to go and see Ibisbills, Bearded Vultures, Himalayan Rubythroats and Brown Dippers. And while this whistle was effective, and while I went on to conquer the day, these little finches were even competitors for the top spot on my day list. You have to be happy when you see something like this so close to a parking lot! Amazing they stay all year despite the weather! I love the photo of the three in a row with their bright red patches! @Pat: You need to go there. It is so freaking awesome and a visit there is worth the looooong trip to Kazakhstan! @Clare: you have to be happy to bird in the Tien Shan. Everytime, everywhere, no matter what bird is around. Very magnificent mountains. And I often wonder how any bird can survive central Asian winters, regardless of altitude. @Pat: it sure is cool. And I might have another post about Big Almaty lake. @Wendy: glad you enjoyed this little composition. It really brings out the feeding action of the bird. Their red spots are great! 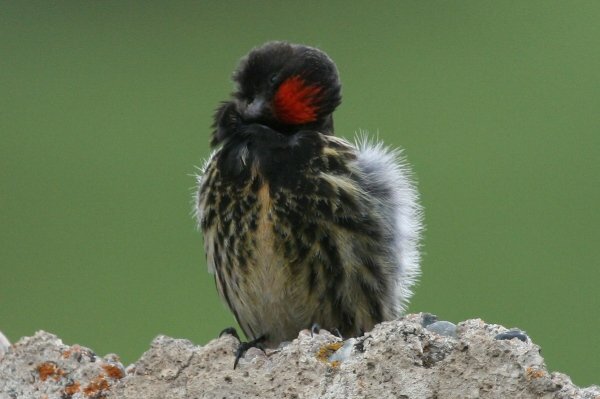 Someone should write a blog about Birds With Great Fashion Sense. That red patch really makes their outfits “pop out”, as they say on Project Runway. Are those pictures taken with your old camera?. Hi Laurent, how are you, Diane and the kid(s ?!?)? Well, the camera is still the same, good ol’ Canon Digital Rebel XTi, but the lens is now a Canon 100-400 mm. Nice piece of metal. Not mine though – the company’s. Where Are You Birding This Fourth Weekend of April 2018?